The developer of Spaulding Green, a 400-acre housing community in Clarence, New York, realized target buyers preferred homes built into hillsides with walk-out basements. The land being developed was essentially flat, though. To make the walk-out basements possible, Greenman-Pedersen Inc. (GPI) got creative and turned flat land into varied terrain with ponds, hills and elevated roads. More than a decade later, after collaboration with federal, state and local governments, the endeavor is nearing completion. GPI is a national engineering, planning, survey, mapping, construction management and inspection firm. While the company as a whole is known for its transportation and bridge engineering work, the Buffalo-branch is a go-to resource for land development services in western New York. When Spaulding Green LLC sought to develop the 400 acres, the company reached out to GPI’s Buffalo branch, a longtime partner. Phase by phase, GPI has worked with Spaulding Green LLC to balance customer desires with green space requirements, wetland logistics, traffic feasibility studies, town and county ordinances, archaeological challenges and more. The hard work is paying off; for three years, the Spaulding Green development has been the site of the local builders’ association home show. The work began in 2003 with what project manager, Ken Zollitsch, calls a “vast number” of concept plans and iterations. The initial concepts included commercial components, but as the town was opposed to that, Spaulding Green took on a more traditional, single-family development. Then the town enacted an open space overlay district, which allowed for smaller lots with both single and multi-family homes, so GPI adjusted the concepts to include a mix of large estates, single-family residences and multi-family units. The open space overlay district also required that a full 50 percent of the 400-acre site remain as undeveloped green space. That meant, as lots changed, GPI had to be careful to reallocate green space. GPI worked with the town to develop a full environmental impact statement, flood plain analysis, economic and school impact assessments and a traffic study. Once those were completed, the land development plans were tweaked again. 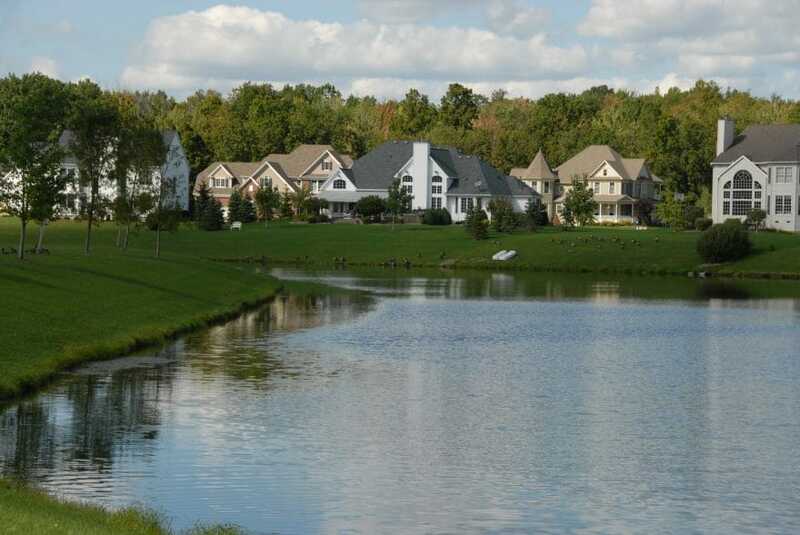 All the while, GPI sculpted manmade ponds throughout the development to enhance and beautify lots, meet storm water management requirements and get the fill necessary to create the hills and mounds that allowed walk-out basements. “It was such an involved and complex project that it involved all the different facets of what we can do here as a branch,” Zollitsch says. Aside from the land development, GPI also performed boundary and supplemental topographical survey work and inspections for water lines and sewer. As each phase of the project was built, GPI designed the next, adjusting plans along the way. That kind of “phase in, phase out” work is common for GPI, Zollitsch says. What was not common was the number of agencies that needed to sign off on each phase. Those agencies included the New York State Department of Environmental Conservation and the U.S. Army Corps of Engineers, which oversee state and federal wetlands on the property, as well as New York’s State Historic Preservation Office because there were archaeologically sensitive sites, and town and reviewing agencies and utilities. Zollitsch says he believes GPI secured the project because of a long-standing relationship with the developer and GPI’s reputation for being able to handle large, complex projects. GPI has worked with the town of Clarence, for instance, on sewer work and reviewed traffic studies done by a third party in a neighboring town. “After you’ve been working with the town for so long, you kind of know what they expect and what they want, and that’s what we give them,” Zollitsch says. In his opinion, GPI produces the best quality plans in the area and its creative designers have the ability to address complex problems. “The quality of our plans is tough to beat,” he says.